Cleveland Browns general manager John Dorsey hopes the arrivals of Odell Beckham Jr. and Olivier Vernon will awaken his "sleeping giant" of a franchise. The Browns shook up the NFL landscape when they completed a blockbuster trade with the New York Giants to acquire the pair, their moves becoming official on Wednesday. Guided by rookie quarterback Baker Mayfield, the Browns were much improved in 2018, going 7-8-1 having won only four games across the previous three seasons combined. And GM Dorsey believes the likes of Beckham and Vernon can help them continue that upward trajectory this year. "Hopefully, they are some of the pieces that will help us awaken this sleeping giant," he said. "Each of them respectively are very good football players who will come in here and help us achieve our goal, and that's to be competitive year in and year out in the AFC North." Dorsey explained the amount of work that went into completing the trade and he reiterated the goal moving forward is to build a winning team, just two years after going 0-16. "It's a reflection of the direction the organisation is headed," Dorsey added. "We spent countless hours, weeks - I mean, we can go all the way back to December when we began the planning phases of these types of acquisitions. "So my hat's off to a lot of people in the personnel department and the coaching staff. And for ownership for allowing these types of things to happen. It shows you that ownership is committed to winning." 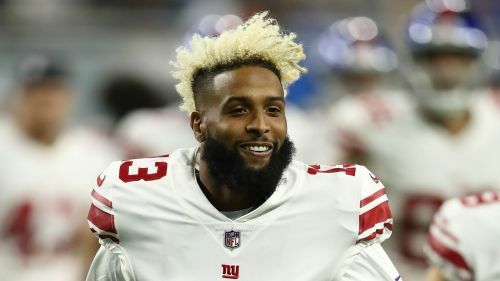 Beckham, 26, has spent his entire five-year career with the Giants after they selected him with the 12th overall pick in the 2014 draft. He has eclipsed more than 1,000 receiving yards in four of his five seasons – the only exception being an injury-hit 2017 in which he played just four times. The 2018 campaign saw Beckham compile 77 receptions for 1,052 yards and six touchdowns as well as two passing TDs over 12 games, and Dorsey acknowledged how rare it is to sign such a talent. "He's probably if not the one, one or two best receivers in the National Football League," Dorsey said. "Very rarely do you get a chance to acquire a player of this magnitude. He's at a relatively young age. He's got a lot of football left in him. Great hands, great work ethic, committed, competitive, he really wants to be great. And that's all you can ask for." As part of the deal, Cleveland sent right guard Kevin Zeitler and safety Jabrill Peppers to New York, in addition to their 2019 first-round pick (17th overall) and the 2019 third-round selection (95th overall) they acquired in a 2018 trade with the New England Patriots.